Dublin, Ireland's Era Vulgaris have been making themselves heard in their native land since forming in 2004. Slaying audiences with their support of notable bands such as Amon Amarth, Candlemass, Entombed, and fellow countrymen (and woman) Cruachan, the quartet was named one of the Top 100 Bands to Watch in 2007 by Rock Sound Magazine. Such distinction is due in part to their skillful musical execution, but a more significant reason for it lies in the band's ability to produce an interesting aural cocktail by fusing elements of technical thrash, prog, and Doom/Death. 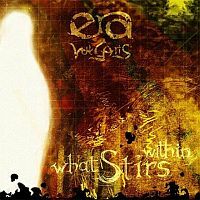 Having honed their style on the stages of Ireland, Era Vulgaris present themselves to the metal world with their debut album What Stirs Within, 8 tracks of intricate brutality sure to intrigue, if not please, most metal fans. After a quote from the film Dune, the band gets down to business with the blistering lead-off track "Brittle". Blackish riffs and thrashy beats are blended together as frontman Chris Rob screeches the lyrics with gut-wrenching abandon. Chris is actually a multi-dimensional vocalist, howling one moment and crooning through a chorus the next. However, his primary style is to angrily spew forth the lyrics in a forceful, but understandable, rage. While it's nearly impossible to draw a comparison to Chris' style, on "Just Ask Yourself" he adopts a bit of a Mustaine/Anselmo manner that serves the song well. While the lead-off track flew at a frantic pace, the second track slows the pace and adds an element of groove that reaches back to the Bay Area days of yore. It's here too that Era Vulgaris offers a taste of their progressive tendencies, delivering a couple of meandering breakdowns featuring bass solos and wandering leads. Such diversions are fairly rare, but on "I Must Have Your Brain" the band experiments with an extended journey into the disjointed harmonics of progressive music. Not being much of a fan of such rambling, the distraction is thankfully short-lived and the core sound returned to. Constructing a bombproof foundation on which the rest of the band gyrates, drummer Chris Con is a versatile master of the kit. Having previous jazz and break beat experience, Con weaves a complex pattern of rhythms and time changes that keep the listener guessing while maintaining a linear ebb and flow. So it is with the entirety of What Stirs Within, as each track contains enough variety and emotion to keep the album feeling fresh over numerous listens. As enjoyable as all the tracks are, "Limb From Limb" stands apart from the others as my favorite for the very old school thrash riffs and occasional Gothic growls from Chris Rob. Dave Buttner's bass is also fairly prominent and serves to deepen the impact of the song. The album ends with the 11-minute instrumental "Imram", enveloping all of the various elements that comprise the style of Era Vulgaris. While the production is a bit flat and the guitars are a little loose, the wealth of talent displayed on the album makes Era Vulgaris more than worthy of the praise they've thus far received from the international metal community.